Hard to imagine, but once upon a time Marvel only put out one Avengers comic a month. The 1980s changed all that when Hawkeye moved to LA with some fan favorite Avengers and banded together as the West Coast Avengers. About a year and a half in, the team literally had an adventure for the ages as we'll cover in this multipart retrospective. "Beginning the West Coast Avengers' Greatest Adventure!" 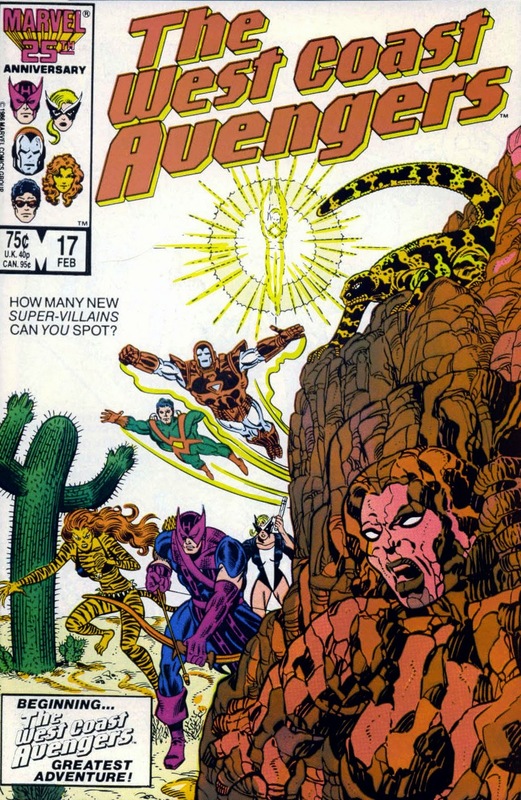 Readers probably didn't realize at the time just how right that promo blurb on the cover of February 1987's West Coast Avengers I#17 would turn out to be. With no online sollicitations spoiling storylines three months in advance, people were just going to have to stick around to see what long time Avengers scribe Steve Englehart was up to. 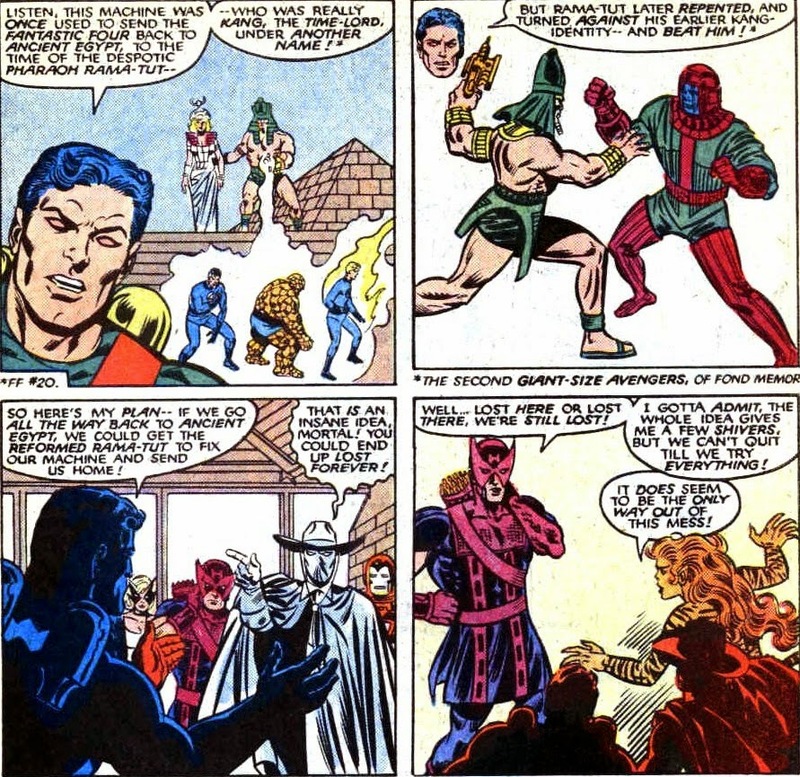 Things started off slowly, with the Avengers deciding to invite Firebird (Bonita Juarez) to join up. She'd been hanging around the Avengers' LA compound for most of their early missions and was actively trying to join, but Hawkeye still believed the team was bound by the government's old rule that prohibited the Avengers from having more than six active members. Disappointed, Bonita eventually went home to Albuquerque. All the more reason for the team to surprise her in person with the good news. 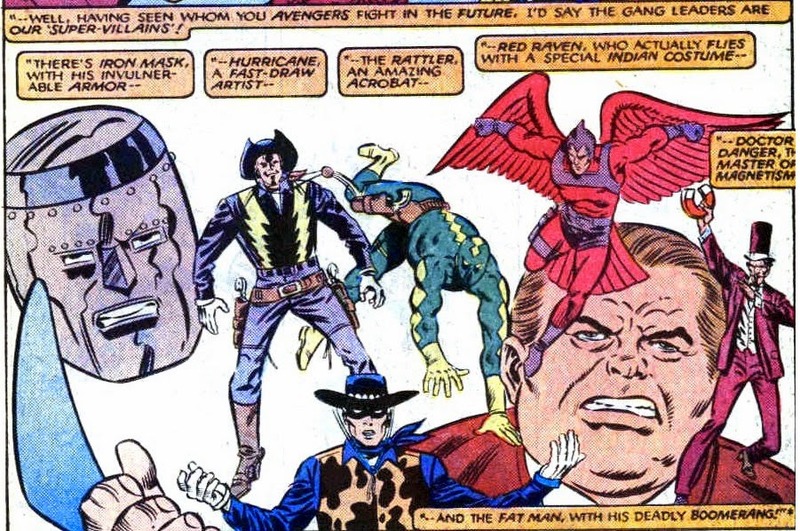 At first glance, the Avengers' trip to New Mexico wasn't the most important part of the issue. 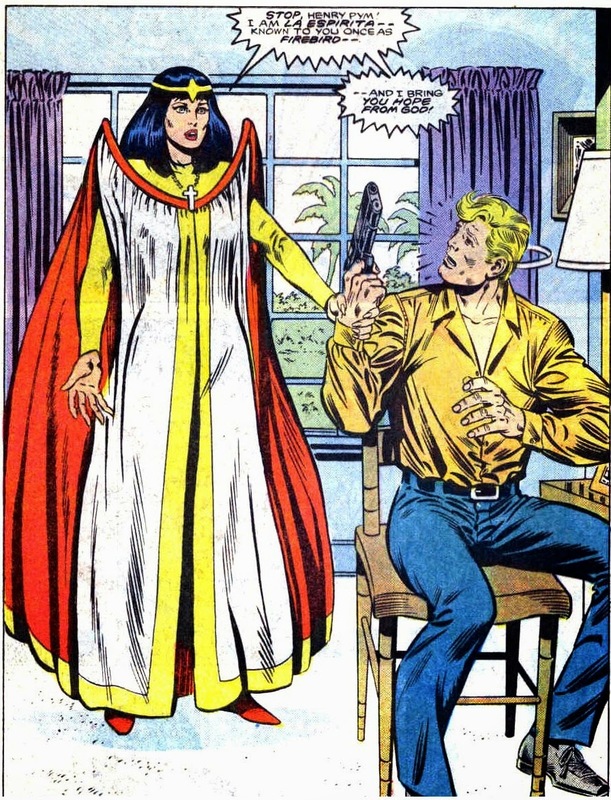 No, that dubious honor went to Hank Pym. At one time a celebrated founding member, but he'd left the team in disgrace following a lenghty storyline in the early 80s. Now, he was hanging around the Avengers West Coast operation, acting as the team's major domo of sorts. But after getting dumped by Tigra and a particularly scathing run in with his former foe Whirlwind, his self confidence was shot. "It's time I killed myself..."
Who knew overreacting was a super power? But before we get back to Hank, who got busy putting his affairs in order, let's check in with the Avengers who were having trouble of their own in Albuquerque.. Y'know, apart from keeping the spelling of the town name straight. As it turned out, Firebird had gone missing! No one had seen her in over a month, leading the Avengers to search the town which led to their run in with the hidden supervillains shown on the cover. "You face the fury of Sunstroke! And Gila! And Butte!" ... And don't forget Cactus, though I couldn't if I tried. 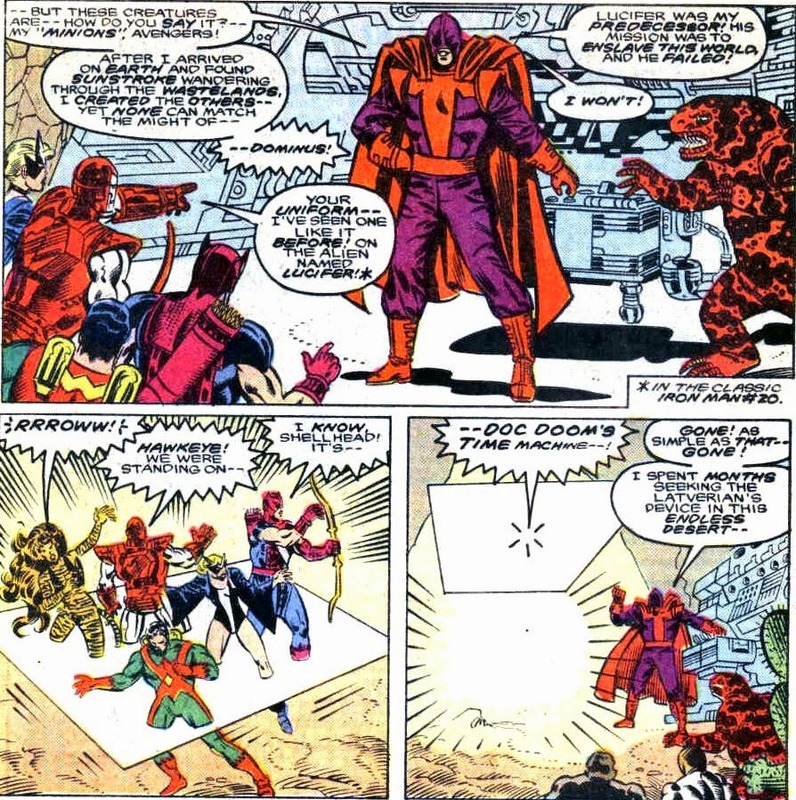 This team of desert based supervillains exemplified a problem that plagued the book: the West Coast Avengers had a laughable rogues gallery. 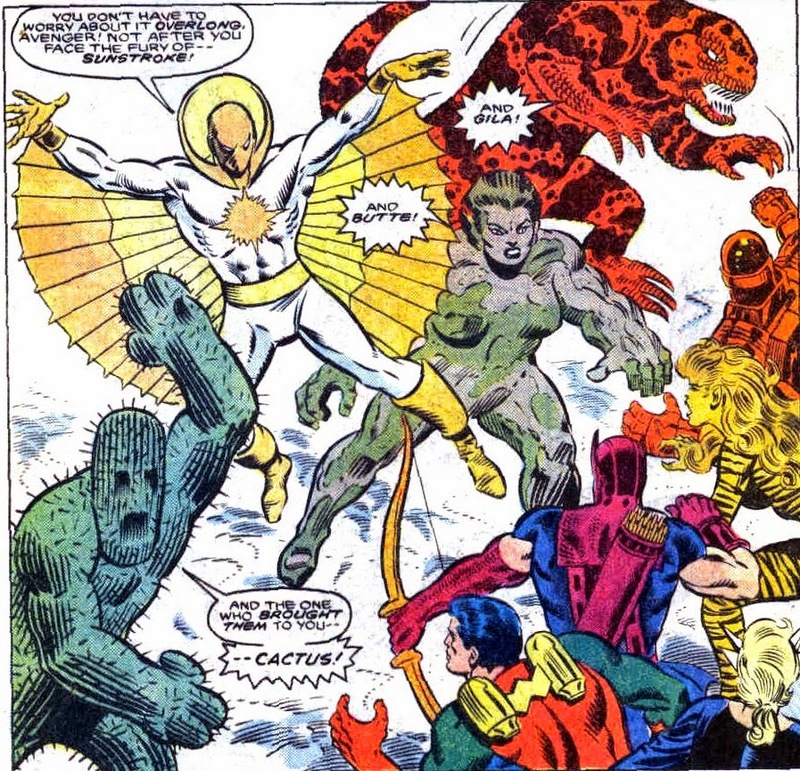 Sure, they came together fighting Graviton and even held their own against Ultron, but for every adamantium killer robot they faced, there was a Blank, Master Pandemonium and whatever the heck Headlok was supposed to be. So in a sense these jokers fit right in and actually proved somewhat formidable. "Who does Simon think he is anyway? but we've never found that out for sure!" During the fight, Englehart managed to deliver some interesting exposition. 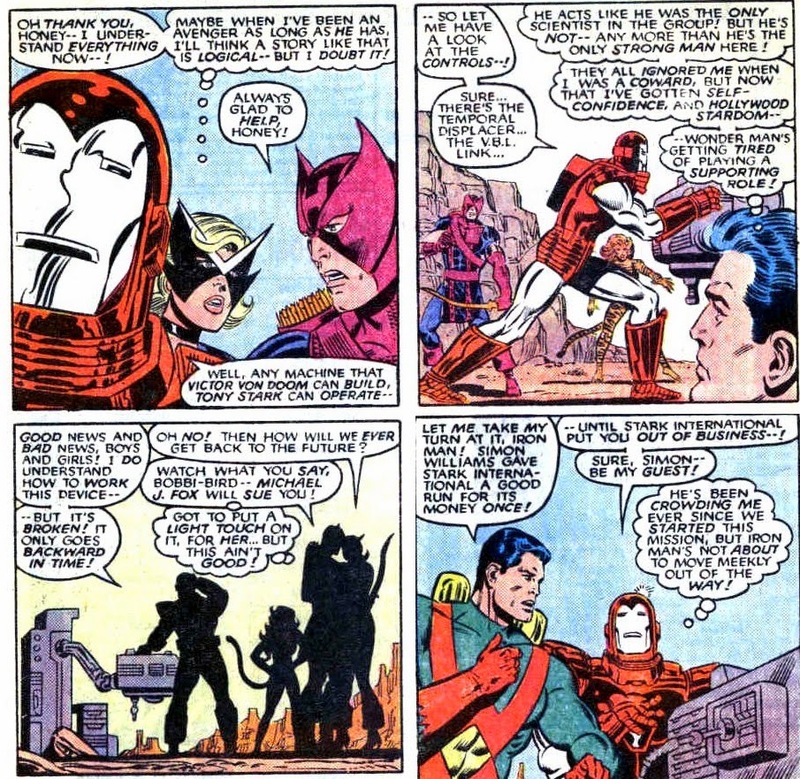 This particular grouping of Avengers was troubled, specifically because of Wonder Man's renewed sense of arrogant entitlement. After having overcome his fear of death, self doubt and shame over his past misdeeds, Simon Williams was now a a celebrated Hollywood star with an ionic ego to match. He felt he was more powerful, smarter and competent than anyone on the team, which rubbed the equally immodest Iron Man the wrong way. Nothing wrong with a little friendly competition, but as we'll see next time, Wonder Man's arrogance would lead to reckless and potentially lethal behavior. For now, the Avengers managed to beat back their opponents who, rather mysteriously, were all pulled away by an unknown force. Snubbing Wonder Man who also wanted to chase them, Iron Man claimed he was the fastest Avenger and took off. 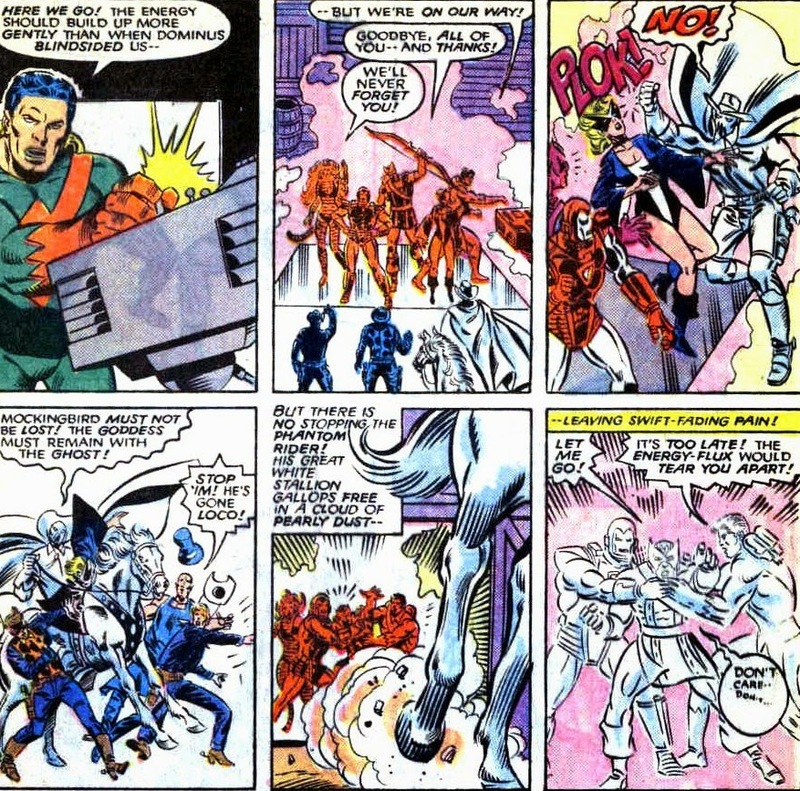 He traced the villains to a hollowed out butte in the desert and when the Avengers went in to confront the bad guys, they encountered the villain of the piece: Dominus. "Hawkeye! We were standing on... Doc Doom's time machine...!" Well, that's one way of getting rid of your enemies: just lure them to your lair and have them stand on a faulty time machine, preprogrammed to whisk them away to the distant past. And so, the Avengers find themselves transported from 1987 to, as they soon found out, sometime during the 1870s. The West was still being won and Mockingbird had a little trouble taking it all in. "S.H.I.E.L.D. 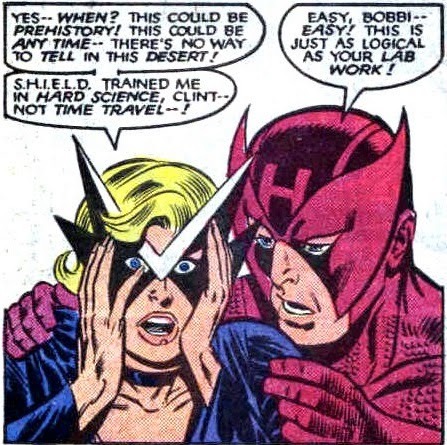 trained me in hard science, Clint... Not time travel!" Bobbi's confusion adds a welcome layer of realism to the situation. To long time Avengers like Hawkeye, Iron Man and even Wonder Man the idea of finding yourself stuck in a different era is pretty much old hat. The last time Clint travelled through time with Englehart at the helm, he was guided by a talking stick called the Synchro-Staff (secretly a disguised Space Phantom working for Immortus, but that's neither here nor there). After helping his wife calm down, Hawkeye learned that Doctor Doom's time platform was damaged. Apparently, the device was so damaged it actually travelled with them through time, control system and all. Iron Man offered to look it over, but here's where Wonder Man's ego asserted itself once again. Wonder Man's getting tired of playing a supporting role!" Which led Wondy to take charge of trying to repair the transistor powered time machine when spare parts from Iron Man's armor turned out to be incompatible. Before they could determine their next course of action, the team was alerted by the sound of nearby gunfire. They decided to check it out and discovered Hawkeye's old friend the Two-Gun Kid was in the thick of things. Of course, the superheroes quickly turned the tide and sent the bad guys packing. and then decided I liked it better back in mine!" 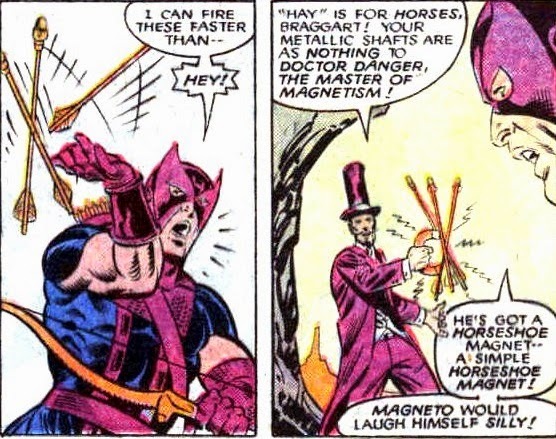 "Well, I'd say the gang leaders are our 'super-villains' "
"He's got a horseshoe magnet... Magneto would laugh himself silly!" to fix our machine and send us home!" Despite the Phantom Rider's protests, the Avengers decided that aiming for Rama-Tut's Egypt was their best bet. So, they programmed Doom's time platform to continue their journey into what was, conveniently ignoring the fact it's a time machine, not a time and space machine... In other words, to reach Rama-Tut's ancient Egypt, they'd have to travel to Egypt first. Instead, the team figured the best course of action was to make their next jump right then and there. Only for the Phantom Rider to do something rather unexpected at the last possible moment. "Mockingbird must not be lost! The goddess must remain with the ghost!" Can we really expect sane and rational decisions from a man who dresses in white fluorescent paint, pretending to be an actual ghost? Moments before the time platform sent the Avengers on their way, Phantom Rider kidnapped Mockingbird and rode off with her. This meant what started out as a straightforward superhero tale turned into a story told in three timeperiods. The 1870s, the Avengers' next destination and... the present. 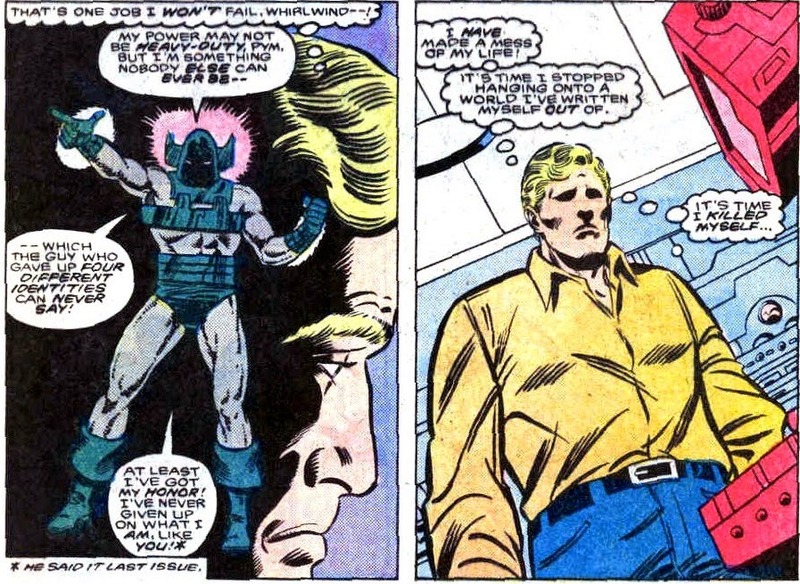 Remember how we left Henry Pym just when he was ready to blow his brains out? "He can smell the bullet..."
Wha, another super power, Henry? All kidding aside, Al Milgrom is often disparaged for his art and while Secret Wars II certainly isn't his best work... Consider this sequence. You almost don't need that one line about Pym being able to smell the bullet to get what is going on. 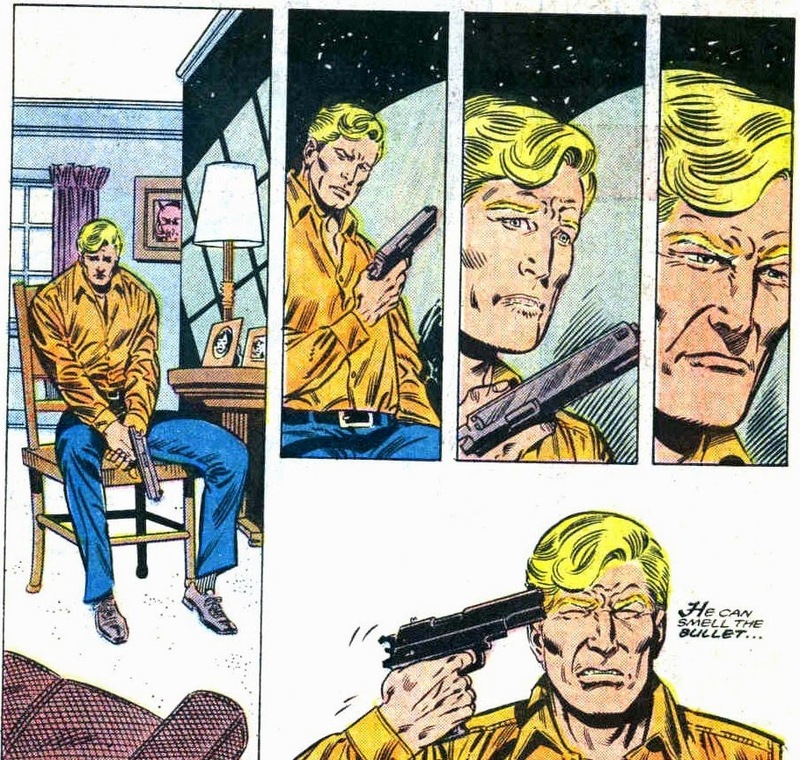 Hank's emotional journey to actually getting ready to pull the trigger is remarkable. He goes from feeling lost and terrible to committing to his action, even fighting off a brief moment of doubt. Great work from the art team of Milgrom and inker Joe Sinnott. But, before the tragedy can take place... All of a sudden, there's God so quickly. And I bring you hope from God!" Good stuff, I'm on the edge of my seat!